News and Information Pest Management Professional: JP Miller & Sons Services tackles challenges unique to Florida pest management professionals. Pest Management Professional: JP Miller & Sons Services tackles challenges unique to Florida pest management professionals. In Florida, mosquitoes are a part of everyday life, thanks to aquatic ecosystems and a humid climate. Currently, 80 mosquito species have been identified there — more than any state in the country, according to the University of Florida’s Institute of Food and Agricultural Sciences. 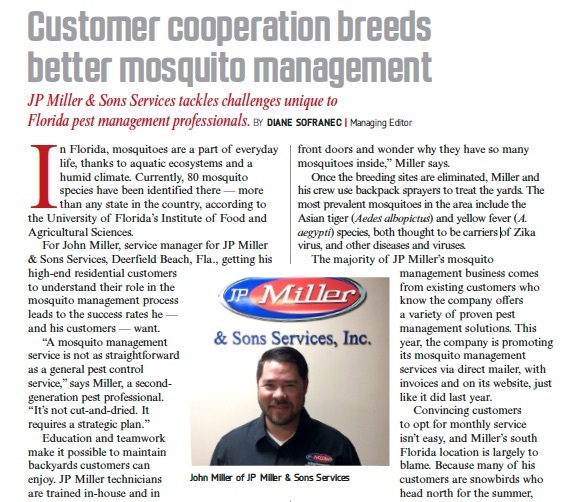 For John Miller, service manager for JP Miller & Sons Services, Deerfield Beach, Fla., getting his high-end residential customers to understand their role in the mosquito management process leads to the success rates he — and his customers — want. Education and teamwork make it possible to maintain backyards customers can enjoy. JP Miller technicians are trained in-house and in the field to recognize any mosquito breeding sites homeowners should eliminate. “People think they keep their property shipshape, but there are areas that create breeding sources,” Miller says. JP Miller technicians are trained to walk around properties before treatments begin, and point out problems as part of an integrated pest management (IPM) approach. They call attention to gas grills, boats, discarded tires, dead leaves under shrubs, and flowerpots that commonly collect water unbeknownst to many homeowners. Even flowers can be problematic. In Florida, he says, flowerbeds at many homes feature bromeliads — cup-shaped flowers that tend to hold rainwater. “They plant them outside their front doors and wonder why they have so many mosquitoes inside,” Miller says. Once the breeding sites are eliminated, Miller and his crew use backpack sprayers to treat the yards. The most prevalent mosquitoes in the area include the Asian tiger (Aedes albopictus) and yellow fever (A. aegypti) species, both thought to be carriers of Zika virus, and other diseases and viruses. The majority of JP Miller’s mosquito management business comes from existing customers who know the company offers a variety of proven pest management solutions. This year, the company is promoting its mosquito management services via direct mailer, with invoices and on its website, just like it did last year. Convincing customers to opt for monthly service isn’t easy, and Miller’s south Florida location is largely to blame. Because many of his customers are snowbirds who head north for the summer, most find they have no need for mosquito control during the height of mosquito season. Instead, Miller aims to attract new customers by offering existing customers discounts for referrals. “It’s easier to promote to our own customers and use word of mouth to find new business,” he says. The Zika virus also will likely lead to more mosquito management business, Miller says, even though the panic that stemmed from the initial news reports has died down.